July | 2012 | 50 Westerns From The 50s. 50s Westerns-ish DVD News #96: Gold For The Caesars (1963). 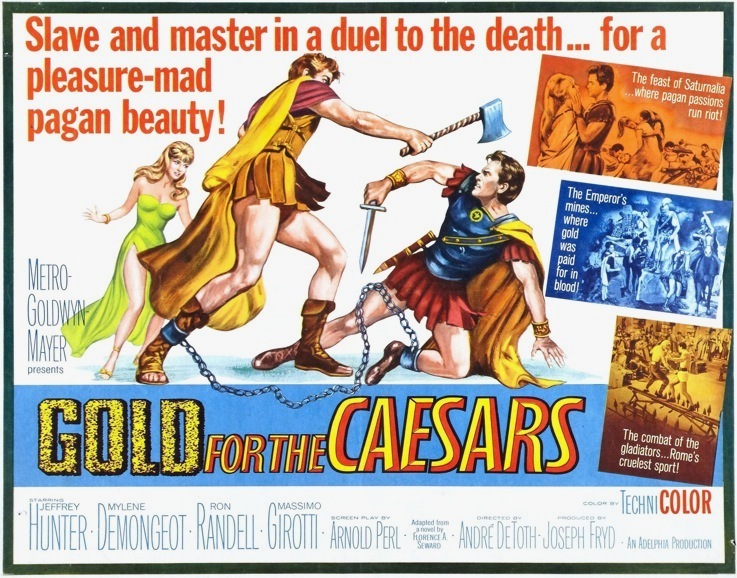 Warner Archive has come up with a real curio, something I’ve been wanting to see for some time — Gold For The Caesars (1963), an Italian sword-and-sandal picture starring Jeffrey Hunter (The Searchers) and directed by Andre de Toth (Man In The Saddle). Hunter also made a spaghetti Western, Find A Place To Die (1968), while de Toth made a handful over films in Italy, including Morgan The Pirate (1961, starring Steve Reeves) and The Mongols (1966). R. G. Armstrong, 1917 – 2012. The great character actor R. G. Armstrong passed away on Friday. He was 95. Mr. Armstrong appeared in a couple 50s Westerns, From Hell To Texas (1958, below) and No Name On The Bullet (1959), but really made his mark in the 60s and 70s. 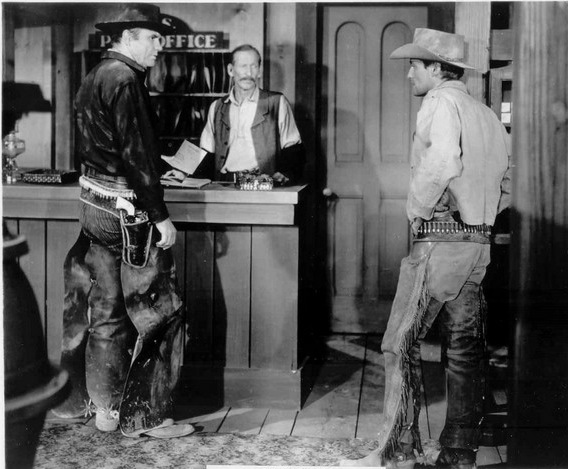 Sam Peckinpah used him a number of times, beginning with an episode of The Westerner, with terrific results. 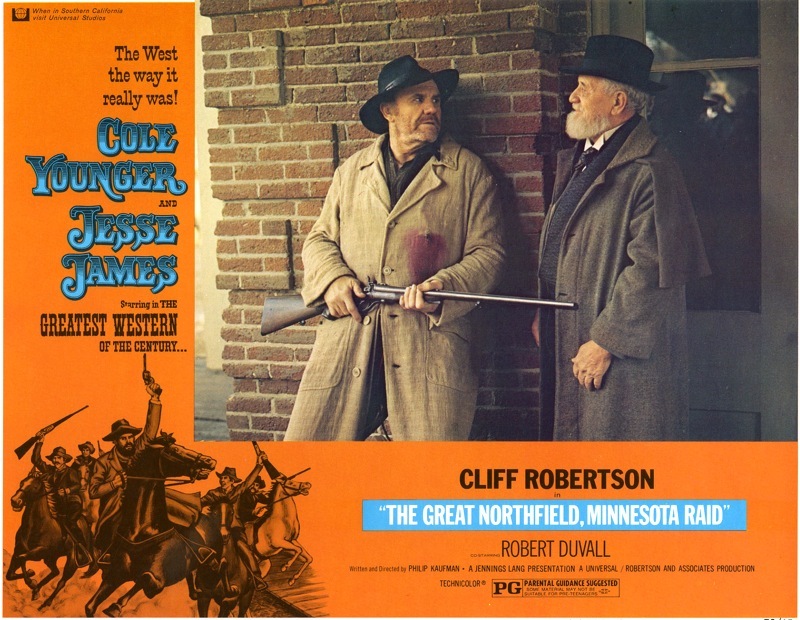 Philip Kaufman’s The Great Northfield, Minnesota Raid (1972) is an overlooked gem with a great part for Armstrong. As a kid, he scared me in Race With The Devil (1974). Originally from Alabama, he got a Masters in English from the University Of North Carolina at Chapel Hill, just down the street. I doubt anybody on campus today knows who he is. 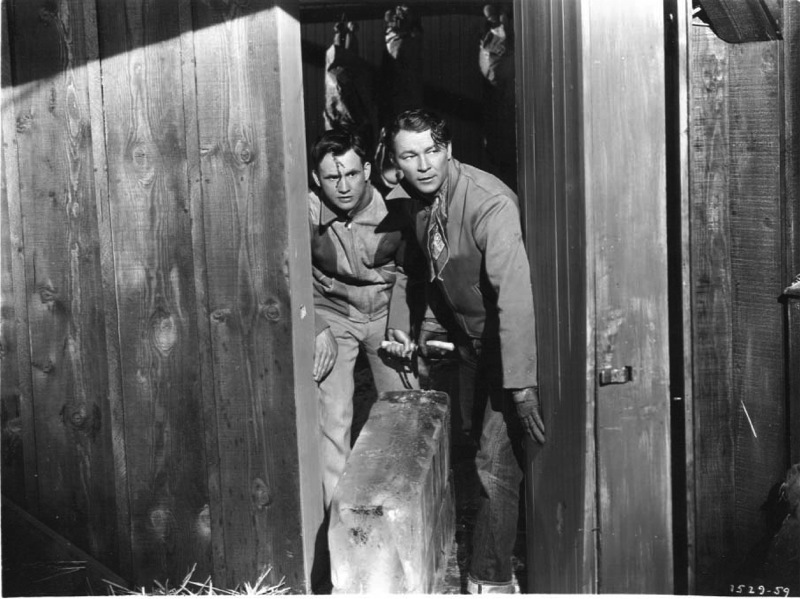 DVD Review: Springtime In The Sierras (1947). 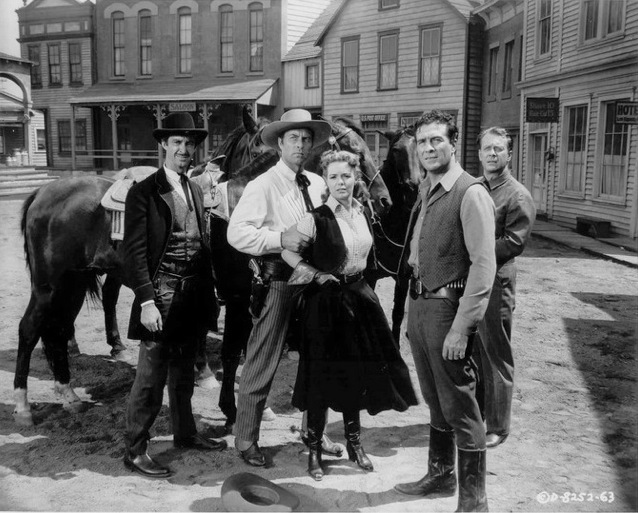 CAST: Roy Rogers, Trigger, Jane Frazee (Taffy Baker), Andy Devine (Cookie Bullfincher), Stephanie Bachelor (Jean Loring), Roy Barcroft (Matt Wilkes), Chester Conklin (Old Timer) and Bob Nolan and The Sons of the Pioneers. 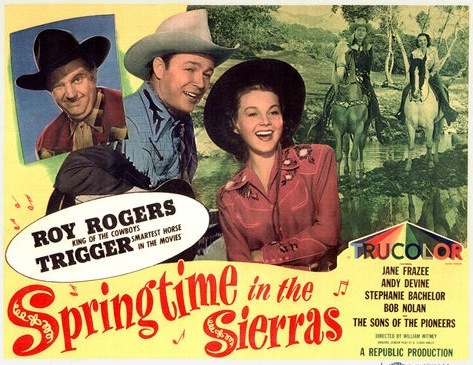 In what has to be one of the worst examples of shortsightedness in Hollywood’s history, Republic Pictures cut the Trucolor Roy Rogers films to a TV-friendly 54 minutes from running times of around 67-75 minutes each. And, of course, the TV prints were black and white. What’s worse, they cut the original negatives and tossed the “scraps,” so the story goes. 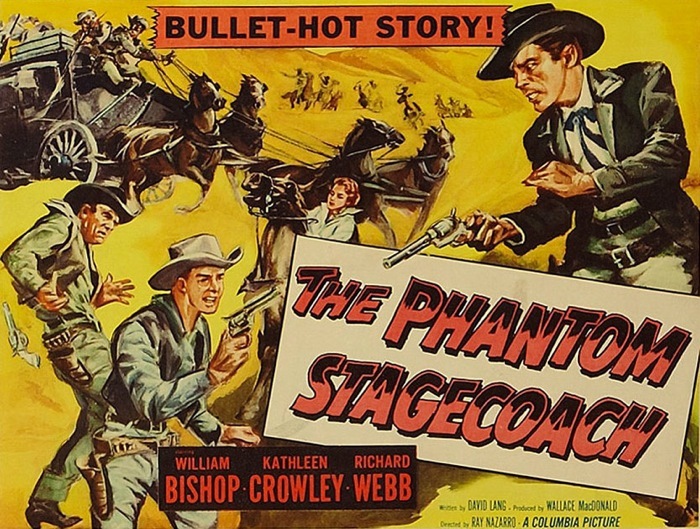 Tracking down the King Of The Cowboys’ Trucolor movies is a real challenge for DVD labels and collectors alike (a fact covered in a recent post). So when another turns up uncut and actually in color, it’s a real cause for celebration. Such is the case with the recently-released Springtime In The Sierr as (1947) from Film Chest. Transferred from an ultra-rare complete 16mm color print, it may not be something you’d use to show off your home theater system to the neighbors, but that’s not the point, is it? It’s Roy, it’s complete, it’s in color and it’s now in your hot little hands. There’s plenty of singing, too, which is a real treat with Bob Nolan and the Sons Of The Pioneers on hand. Andy Devine provides his usual comic relief. Dale Evans isn’t around, but Jane Frazee is — and there’s Stephanie Bachelor as one of the deer-killing villains. Sloan Nibley wrote a number of the later Rogers films. 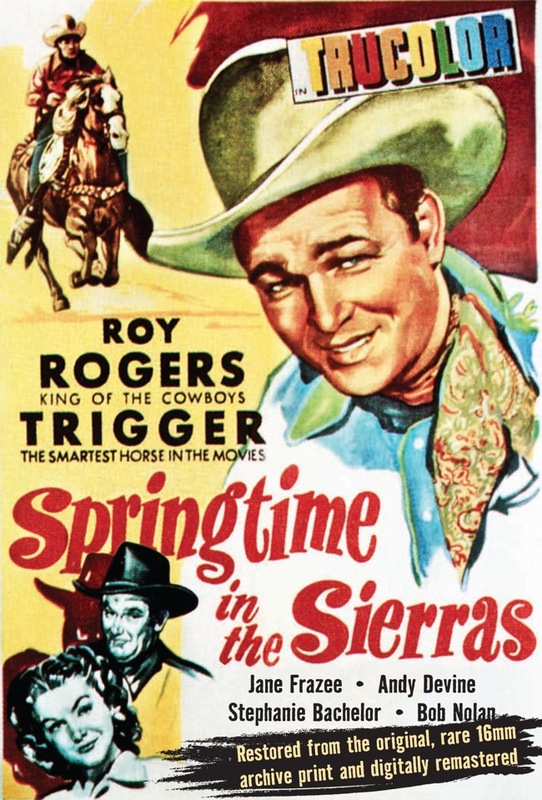 This was one of his first, and it shows his flair for story (usually a somewhat oddball one) and gift for balancing the various elements that make up a Roy Rogers movie. 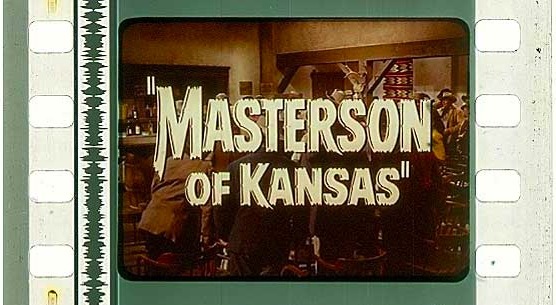 Around the time Roy left Republic for TV, Nibley wrote a few good Western features (Carson City and Springfield Rifle, both 1952) before settling into a busy life as a television writer. So what does the DVD look like? I’m happy to report that it’s all there, from Republic logo to Republic logo. It’s a little soft, attributable to the 16mm material and the Trucolor process. (That’s a screen grab to the left.) If you’ve seen Trucolor before (during this period when it was two-strip instead of three), you know what to expect. It’s a long way from Technicolor, with a rather other-wordly range of hues that I find beautiful. The disc also includes Roy and Dale hosting an episode of The Chevy Show from Easter, 1961. It’s a black and white kinescope of a color program, complete with Corvair commercials and appearances by Martin Milner and George Maharis of Route 66. Film Chest has done us all a favor by helping us check another color Rogers off our Want Lists. The fact that they did it with care makes it all the better. Highly recommended. Back in the early days of this blog, as I was trying to figure out what this thing would and would not cover, I decided to put a real limit on birthdays, which felt a bit like filler. Along the way, I’ve decided not to commemorate the births of some of the genre’s real heavyweights. 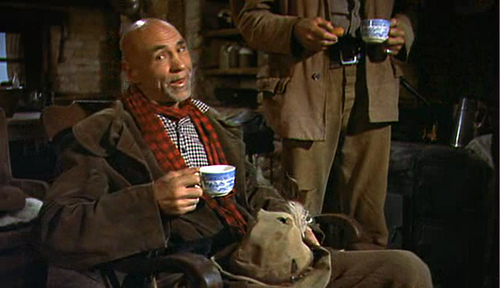 Then there’s Hank Worden. There’s no way I could let this one go by. So many films were enriched by his presence, even if his part’s not much more than a cameo. And on the list of people who I’d like to have met, he’d be in the Top 10. I probably don’t need to point out that the image above is from John Ford’s The Searchers (1956). So, to put a little Hank in your day, which of his many roles is your favorite? Lorne Greene, Somewhere Other Than The Ponderosa. 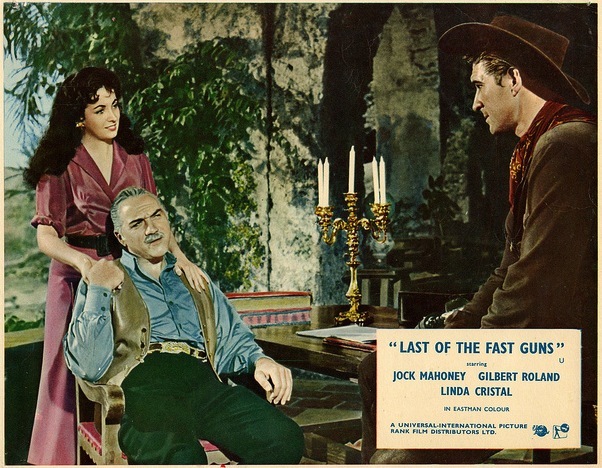 Here’s Lorne Greene, Linda Cristal and Jock Mahoney in Last Of The Fast Guns (1958), a CinemaScope Universal Western from George Sherman. This film really needs to make its way to DVD. Be sure to head over to INSP TV to enter their Saddle Up and Getaway Sweepstakes. Greene and Bonanza are part of their extended lineup. 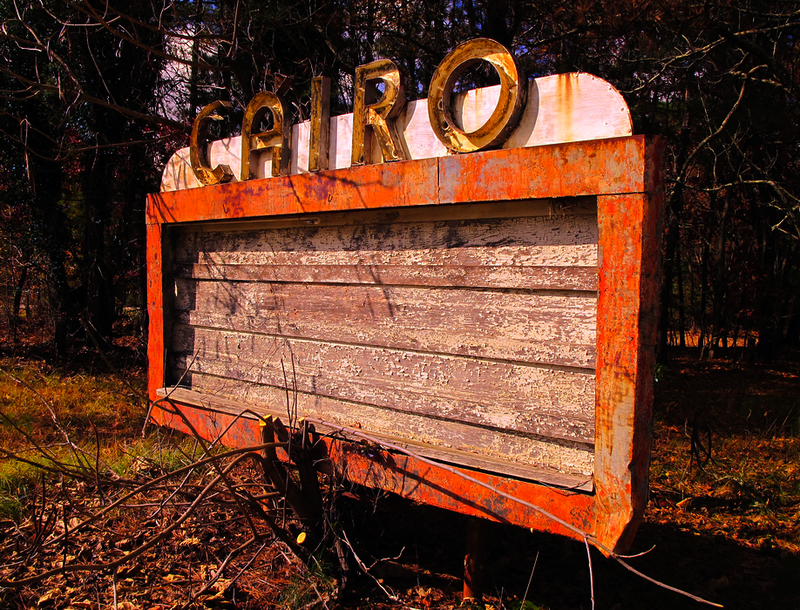 Another drive-in is lost to “progress.” The Cairo, Fuquay-Varina, North Carolina. It’s been closed for years, but the screen tower just came down. I’d love to see a list of what played there — or maybe I wouldn’t.